I’m going to let all in on a dirty little secret: I like Windows 10 10 Surprising Reasons Why You Will Like Windows 10 10 Surprising Reasons Why You Will Like Windows 10 It's almost cool to hate on Windows 10 these days. Don't let that deprive you of all the benefits Windows 10 will bring! We show you what you're missing out on. Read More . I know, I know, I’m a bad person. I’ve accepted this. 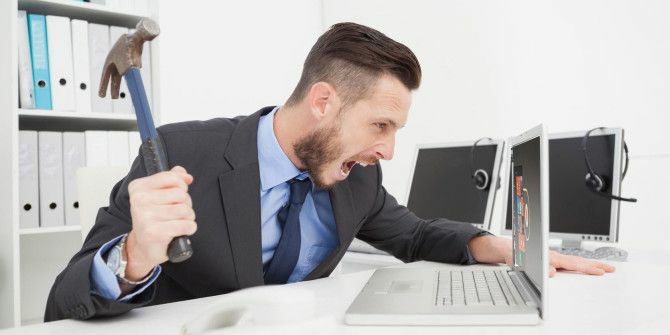 But if you’re not in the same camp as me and you want to stick with Windows 7 or 8.1 Microsoft Strikes Again - How to NOT Upgrade to Windows 10 Microsoft Strikes Again - How to NOT Upgrade to Windows 10 Windows 10 is now a recommended update on Windows 7 and 8.1 computers. If you're not yet ready to upgrade, it's time to double-check your Windows Update settings. We show you how. Read More , or you want to go back to the old version after giving Windows 10 a shot, here’s what you need to do. If your computer hasn’t automatically downloaded Windows 10 yet, you can go to Settings and turn off Recommended Update. At this point, though, most Windows users have already had the update downloaded, which means you can’t make a preemptive strike anymore! Microsoft will have already started the Windows 10 installation for you, and personally, I’d recommend giving it a shot 7 Best & Worst Windows 10 Features 7 Best & Worst Windows 10 Features Was Windows XP your favorite operating system, too? Windows 8 made me switch to OS X. Windows 10 has been my homecoming and while some features are convincing, others still need work. Find out where... Read More if you haven’t since you have 30 days to roll back to your previous version. Doing so is easy! Just go to Settings, followed by Update & Security. On the left, click Recovery. Now, just click Go back to Windows 7 or Go back to Windows 8.1, depending on which version you had before. Follow the steps on the screen that comes up, and before you know it, you’ll be back to your beloved version of Windows. Have you tried Windows 10? What do you think of it? Let us know in the comments! An UPDATE to Windows 10 is NOT the same thing as having the previous Windows OS (for example, Windows 8.1) REPLACED with Windows 10. I accepted the offer to upgrade from Windows 8.0 (which I hated) to Windows 8.1 (which was an improvement, but still not great) and then to Windows 10. At first, I didn't like Windows 10 much either, since it still had too many bugs in it. But I stuck with Windows 10 (through a number of updates (yes, ACTUAL UPDATES to the OS in place .. ie, Windows 10) and have now gotten to the point that I'm liking it, EXCEPT for one real big problem. From time to time (like yesterday), I get a pop up saying that my Windows 10 has to be updated (not replaced, but UPDATED), and that I need to save any work because my computer will be restarted in order to do the updates. I have only 2 options available to me when this happens: 1. Save my work and let the update begin at the time they have listed (with usually will start in about 10 to 20 minutes), OR 2. Start the update immediately. The updates take roughly around 30 minutes to 1 hour (sometimes more) to complete installation, during which time I can NOT use my computer! This is a real big nuisance! What happened to updates being done after I sign off (the updates get done when I no longer need to use my computer, and then shut down my computer automatically when the updates are finished); OR, letting me choose a convenient time to allow for the updates (I really prefer the first choice)? But I'm not offered either one of these options, and that is very aggravating! If I need to use my computer at a particular time (like yesterday), and then find that I can't do so at that time because MIcrosoft has decided to update my Windows 10 right at that time, then maybe it's time to start looking into spending a bit more money and switch to an Apple/Mac computer/OS. After seeing MIcrosoft putting out one "bug filled" operating system after another for so many years, I am, quite frankly, getting fed up with all the hassles. I just installed it on my desktop. I installed it on my laptop a few months ago. I like Windows 10. I admit that it took quite while to get everything working right, but now everything works. If I need to, I can always go back to Windows 7 because I did a clean install and imaged the disk right before I upgraded. I wouldn't have done it any other way. I hated Windows 8, so I really didn't expect to like Windows 10, but it works for me. I tried it and my screen just flickered on and off . was totally useless until I figured out how to reverse the install...I'll not be trying it again. Thanks for the tip on turning off the recommended update.